Sandow Birk’s investigation of US culture and politics is unusual in that its own explicit politics are not overly didactic — a difficult line to walk successfully. The stated theme of Triumph of Evil is most evident in the exhibition’s eight paintings, which contain little humor or satire. “The Triumph of Death (Las Vegas)” (2018) shows the aftermath of the 2017 Route 91 Harvest music festival shooting. A group of lifeless figures have been thrown into a cart, piled atop one another. The ground is strewn with plastic bottles and bodies, an equivalency that reduces people to detritus. Palm trees and the Vegas skyline ground this carnage in a quintessentially American locale. 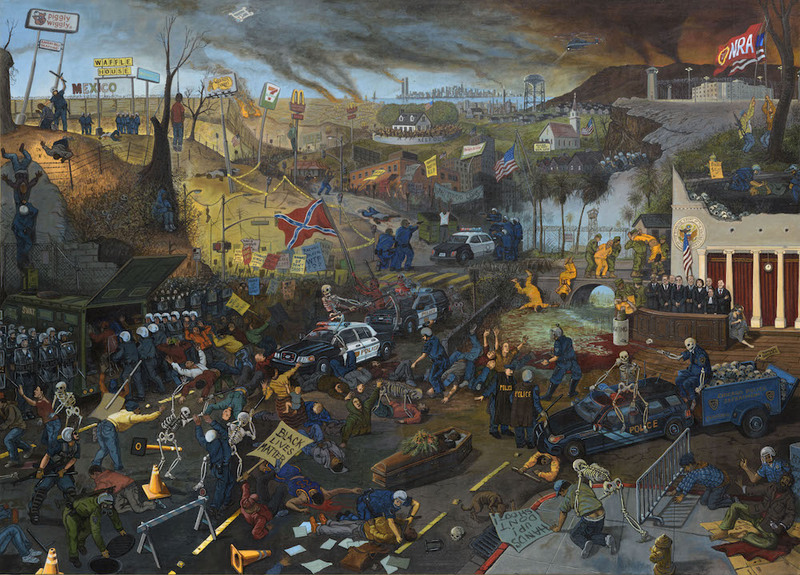 “The Triumph of Fear” (2017) is a similarly complex work, containing imagery of Black Lives Matter protestors being gunned down by police; a man being lynched; skeletons riding atop police cars waving a Confederate flag; military personnel throwing shackled prisoners off a bridge; and the Supreme Court justices standing quietly in the corner, a blindfolded and shackled Lady Justice sitting on the ground to their side. The complexity of Birk’s canvases and their surfeit of action is reminiscent of paintings from the 17th and 18th centuries that depict historical, mythological, or religious scenes. These paintings had an agenda — the intended heroism of Emanuel Leutze’s “Washington Crossing the Delaware” (1851) comes to mind —but Birk’s contemporary take on this genre is total nihilism. There is nothing redeeming in his scenes of violence — no heroes, no myths, no valiance. His upending of a genre of painting usually replete with heroism or moralistic messages adds a layer of art-historical intrigue, a reimagining of what history painting is in this moment. In “American Procession,” three woodblock prints produced through a collaboration between Birk and artist Elyse Pignolet, the dark sides of the US are not necessarily victorious, but rather are locked in an unending battle against good. In color and form the work references the Fürstenzug (Procession of Princes) mural, an 1871-76 work at Dresden Castle, Germany that depicts the noblemen of Saxony. On one side of “American Procession,” princely figures including Abraham Lincoln, Florence Kelley, Gertrude Stein, Martin Luther King, Nina Simone, Cesar Chavez, Billy Jean King, Ruth Bader Ginsburg, Barack and Michelle Obama, and Kamala Harris march. They hold signs reading “hands up don’t shoot” and “we love Obamacare.” This is the long-moral-arc-bending-towards-justice version of US history. 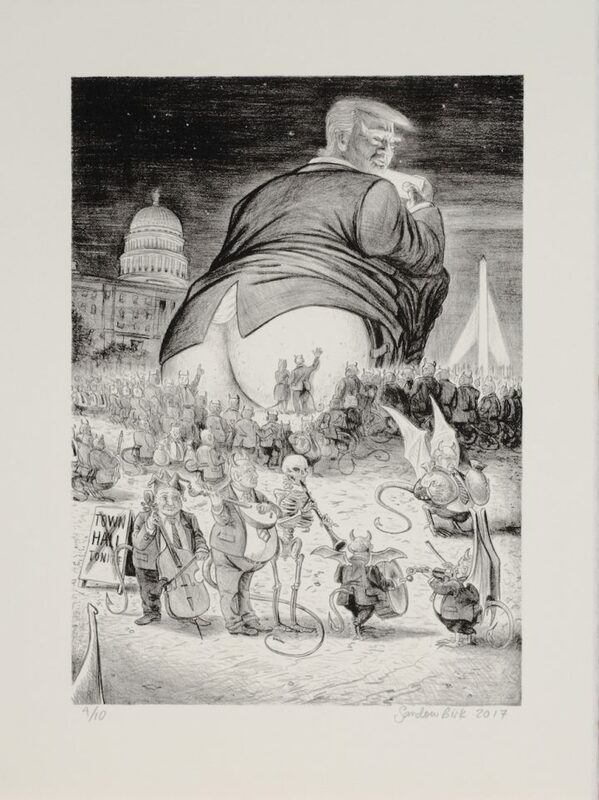 On the opposing side, representations of enslaved Africans, Andrew Jackson, Robert Moses, J. Edgar Hoover, Strom Thurmond, the Koch Brothers, Donald Trump, and the wealthy, demonstrate a darker unfolding of the country that begins with enslavement and ends with the profit of a few at the expense of the many — a straight line of injustice. Unsettlingly, both takes on American history seem equally valid when laid out with such exacting visual equivalency. This is great work for this time. It’s crude and violent, but done in the service of portraying the greed and brutality of its era. However, I am not sure that all of Birk’s art would survive a lack of context. It’s deeply grounded in knowledge of American politics, culture, and history. The only downside of avoiding heroes and myths is that the imagery becomes too precise to easily travel across time and place. 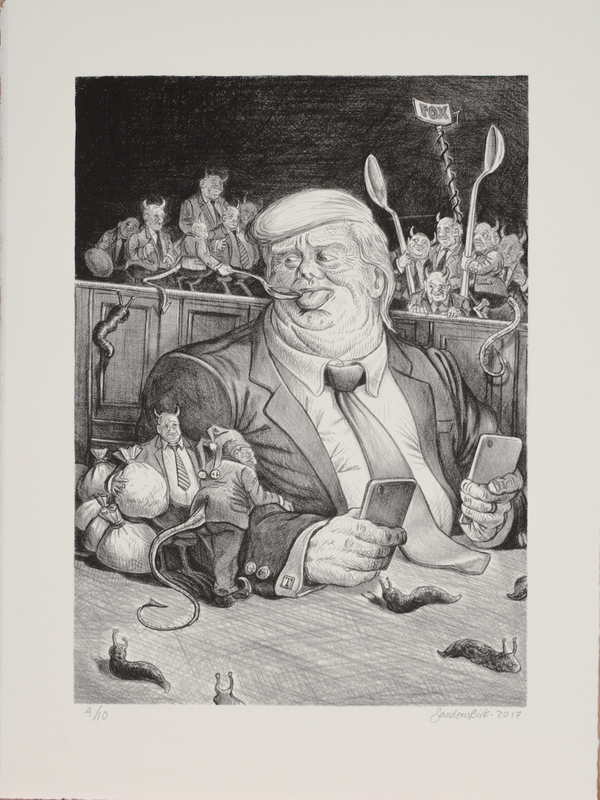 Triumph of Hate, continues at PPOW Gallery (535 West 22 street, Chelsea, Manhattan) through February 9th.